AlwaysFreshFish.com uses only the freshest farm raised Tilapia fillets available on the market. There are two types of Tilapia available for consumption. Farm-raised and wild caught fish. To maintain a consistency of both product and availability of this increasing popular fish, we purchase only the highest quality farm raised Tilapia. The Tilapia comes to us already skinned and filleted and is ready to prepare using your favorite recipe. 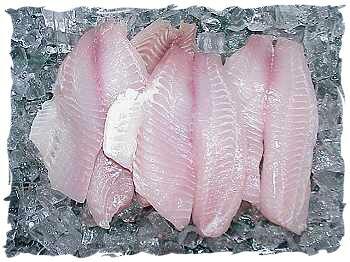 Tilapia fillets are white in color with a mild to bland taste that goes great with sauces. Tilapia is often substituted for Flounder when the later is not available with very little noticeable difference. Many of our restaurant clients tell us that a great number of their customers prefer Tilapia to Flounder. Your fresh Tilapia fillet size will average between 4-8 ounces. 1 lb. Fresh Tilapia + 4 lbs. Add. Selections = 5 lb. Total Order OK! Rinse Tilapia fillets under cold water and let drain. Sauté Onions and Garlic in Olive Oil until Onion is translucent. Add White Wine, Basil and Oregano. Simmer for 1 minute. Add diced Tomatoes (with juice). Simmer for 2 to 3 minutes. Thicken slightly with Corn Starch mixture. Arrange Tilapia fillets on lightly greased baking pan. Cover with Tomato mixture. Bake at 350° until Tilapia flakes easily. For additional information on Fresh Tilapia, please e-mail AlwaysFreshFish.com.